You’ve heard about Long Island Wine Country, but have you ever been there? Here’s everything you need to know and an itinerary specially planned for first time visitors. Long Island Wine Country is the fastest growing and most widely recognized wine producing region in the northeast. Founded over 30 years ago by wine pioneer Louisa Hargrave and her husband Alex, Long Island Wine Country's 40 wineries now produce wine respected by the world’s most recognized experts and connoisseurs. But 30 years is nothing on the scale of vineyards, and Long Island Wine Country, perhaps because of its youth and struggle for recognition, is still a little on the humble side. Most of the wineries are owned by families who take an active role in managing the vineyards, making the wine, and running the tasting rooms. And to me, meeting the people and hearing their stories makes wine that much more enjoyable. 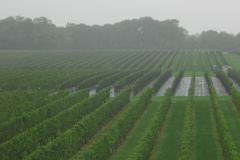 Although all of Long Island is a designated AVA (American Viticultural Area) the wineries and vineyards are most heavily concentrated on the eastern end of Long Island in an area known as the North Fork. This area is surrounded by water which helps regulate temperature and humidity, and creates an excellent environment for the vines. In fact, the area’s climate is very similar to some of the best wine producing regions of France. Needless to say, the grapes grow very well here. The beautiful and bucolic north fork is the part of Long Island most people associate with Long Island Wine Country. The vineyard and tasting room at Bedell Cellars. But enough background info, here’s your “how to” guide to exploring Long Island Wine Country on Long Island’s North Fork. The itinerary I have planned features wineries that in my experience offer the best combination of good wine and tasting room experience for the first time visitor. Long Island Wine Country offers a lot more than just wine. Along the way you’ll see of farms and farm stands, antique shops, restaurants and more. Try to make it to the first winery by 12pm so you’ll have plenty of time to enjoy it all. I’ll assume you’re already on Long Island (see directions if you’re not). 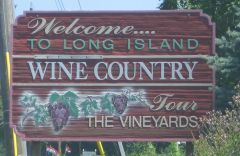 It might help if you download and print this guide to Long Island Wine Country (right click and save) published by the Long Island Wine Council. Take the LIE east to exit 71. Turn right onto Rt. 24 at the end of the off ramp. From this point it’s just a few miles to Paumanok Vineyards, the first winery on our list. This winery is run by the Massoud family and produces excellent wine. 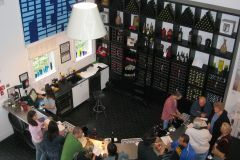 The tasting room is clean, well organized and very friendly. Also look for their East End series of wines, which help support SPAT, Southold’s aquaculture training program. Continue east on Rt. 25. Left on Manor Lane. Right on Sound Avenue (Rt. 48). Look for Martha Clara Vineyards on your right. With a huge tasting room, gift shop and a dining area you’ll probably spend a lot of time here. On most weekends there is a local chef preparing Long Island delicacies in the dining room, so you may want to stay for lunch. Don’t forget to enjoy a free hayride while you’re there and to check out the livestock out back. Continue east on Rt. 48. Right on Love Lane. Left on Rt. 25. Galluccio is set on very large grounds and actually has a sign posted inviting you to picnic on their lawn. Their large tasting room / gift shop is clean and comfortable. In addition to their Long Island wines, Galluccio offers a variety of wines from upstate. Of particular interest to me is a blueberry wine I tasted there last summer. Made only from blueberries (no other flavors or ingredients were added) this wine had all the qualities of a good red wine but with a slight blueberry slant. At this point you can either continue on Rt. 25 to Pugliese Vineyards or, if you have time, you can turn left on Alvah’s Lane back up to Sound Avenue. Heading east on Sound you’ll almost immediately see Castello di Borghese on your right. Formerly Hargrave Vineyard, this is the winery that started it all. Vineyard 48 is next up. There’s a Little Cigar Factory in Vineyard 48, so if you’re into the cigar thing this might be a must see. Continue east on Rt. 48. Right on Cox Lane. Left on Rt. 25. Pugliese Vineyards is a family run operation that produces some of my favorite wines. They are the only winery making sparkling merlot and my favorite everyday red, sangiovese, Long Island’s only chianti. I'm also a huge fan of their Late Harvest Gewürztraminer and Raffaello White Port. I've always felt welcome in the Pugliese family tasting room. I'm sure you will too. From this point on we’ll stay on Rt. 25. Continuing east, look for Bedell Cellars. Michael Lynne, owner of Bedell is trying to become best wine producer in the world and it shows. Combining art and wine his wines, bottles and tasting room are a unique experience. One of my favs at Bedell is Cupula, an outstanding blend of 4 different red wines. Right down the road is Pindar Vineyards. Perhaps better known for the size of their tasting room rather than their wines, Pindar really does have some nice wine to offer. I am particularly fond of their “Champagne.” Well, you’re really not supposed to use the “C” word unless it’s actually made there. Nonetheless, it’s one of the few sparklers I actually like. I’m also a fan of their cabernet port dessert wine. It is truely amazing with chocolate. I can’t say enough about Lenz. Winemaker Eric Fry does a spectacular job producing sparklers, whites and reds. I learned a lot about wine in a wine tasting class led by Mr. Fry. If you’re a wine aficionado definitely visit Lenz. Okay we’re still in Long Island Wine Country, but we’re done with the wineries. Now it’s time for dinner. From Lenz Winery you have a straight run east into Greenport, a rustic Long Island whaling town. 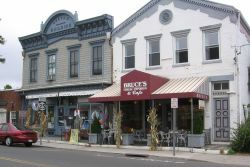 Most of what Greenport offers is concentrated in one small area so I won’t give directions or specifics about where to eat. The best thing to do is find a place to park and just walk around. There are lots of restaurants to choose from with varying prices and menus. The choice is yours. By the way, if you don’t feel up to the drive home there are several hotels you can crash in. Try the Greenporter Hotel (631-477-0066). Not too classy, but inexpensive. On the other end of the spectrum is The Harborfront Inn (631-477-0707). I’ve stayed here myself and it is a very nice place. Very expensive, but very nice. Your best bet is probably the Townsend Manor Inn (631-477-2000). I’ve stayed here on occasion and enjoy the swimming pool and restuarant. As one of the least expensive hotels in Greenport, you can’t beat this place for the price. Please see my guide to Greenport Hotels for more information.